The ancient town of Segovia, lying on a slope of the Guadarrama Mountains with the confluence of the Eresma and Clamores Rivers below, is a delightful taste of the glorious past of the area known as Castile in central Spain. Segovia is 54 miles (91km) northwest of Madrid and is well worth visiting for its reputation as being the most beautiful city in Spain; the journey only takes about an hour by bus (and only 30 minutes by high speed train), making it the perfect excursion. The ancient town has been awarded a place on the UNESCO World Heritage list and is a joy for photographers, with its historic pedigree proudly displayed. 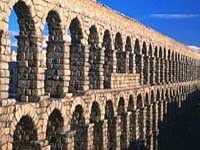 The ancient Romans turned the town into a military base, leaving behind Segovia's famous aqueduct, which begins nine miles from the city and until fairly recently still supplied the town with water. The other main attraction in Segovia is the fairytale Alcazar, a massive fortified citadel, built in the 11th century, perched on the edge of town. It is said to be the fortress that the Walt Disney castle is modelled on. The town overflows with Romanesque churches, 15th-century palaces, narrow streets, and small fountain-splashed plazas, and is best explored on foot.